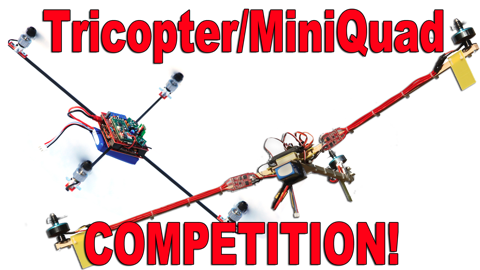 Design a logo and get the chance to win a Tricopter or the MiniQuad! The competition is now over my friends. Over 140 different logo designs were submitted! A big thank you to all that took the time to enter the competition. I will post the best designs here on the blog in a short while to get your input, before I make my final decision on the winner. The winner will be announced on or before January the 25th. Stay tuned! A while back I got a new logo. Unfortunately most people didn’t like it, and to be honest not even I do any more. I tried to come up with a new one but so far I’ve been unable to. It’s time to admit defeat. I need your help! The person that makes the best logo will win either a receiver ready Tricopter V2.5 or the MiniQuad, the winner get to choose! All you have to do is use those gray brain-cells, draw a logo and send it in!